Christian Kent has many labels – warrior, protector, friend, lover – but the one label he never wanted was mate. In his lifetime, the only girl he has ever loved, was the one he couldn’t have. He left her to protect her heart, but his own will always belong to her. As a girl, the one person she believed would never hurt her broke her heart. Now a warrior, she’s loving life and living for the next adventure. She’s put the past behind her, including the man who walked out of her life. Fate brought them together once, and it’s not done with them yet. When they are suddenly thrown together to battle a lethal new foe, sparks fly and old feelings resurface. Chris will have to work hard to heal the rift between them. But will she be able to let go of the old heartbreak and open her heart to him again? Can they come together before the threat they are facing tears them apart forever? I have read all the books in this series..so far. I can not wait to read Jordans story, just wish I didn't have to wait until 2019! I love that everyone is finding their mates and the stories of what they go through to find ajd connect with them. 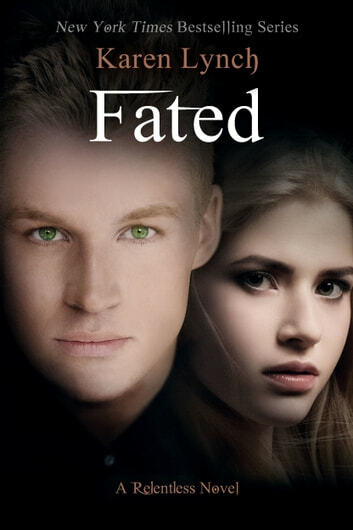 I love, love the extra at the end of Fated. I hope that the series doesn't end anytime soon. I would love for Remy to make more apperances too. I really liked this book and can't wait for 2019 for the next one. Thank you Karen for amazing story. Amazing Book 6 in the Relentless series. I did have trouble getting into the storyline at first, but really wanted to know Chris' story and find out who his mate was. I had some angsty moments with their relationship; loved seeing them work through things and come together. Great job, Karen Lynch! The bonus scene was fabulous; can't wait for the next book! I was quite pleased to read this one. The story was awesome and made me further look forward to Hellion. Also looking forward to the next in Nikolas and Sara's story since...... Yeah, read this book people. Not as good as the first 3, though the premise was interesting, you pretty much know what’s going to happen.